Come February, its celebration for yours truly. The wedding anniversary is an excuse for spending time with two people who make life meaningful, my wife and son, Shruthi and Skanda. We decided to go on the quest for Gangaswamy. It’s a long drive from Palakkad through Mysore and Chikmagalur but it was worth it. Gangaswamy was there! 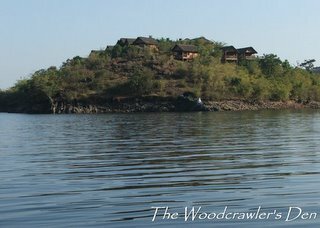 The resort is located on the east bank of the Bhadra reservoir on a small hillock overlooking the expansive body of water. They have ten cottages now. I decline to call them log huts. Unlike BRT this is a predominantly cement and concrete structure with electricity and hot water. Of course no TV, thank God. If you are looking for wildlife you will be disappointed. It’s not to say that wildlife is absent, we saw fresh tiger pugmarks. This patch of green is part of the Bhadra Tiger Reserve and has not been developed with the tourist in mind. The jungle is dense with the undergrowth predominated by bamboo. Wildlife is invisible. The trees here are more massive and so good light for photography is a premium. The ‘tourist’ zone has few waterholes, probably because of the reservoir close by. The salt licks are just being developed and animals need to learn that they are supposed to congregate there to entertain the two-legged visitors. You have a better chance to spot wildlife on the boat trip in the evening. Even the crocs come to bask then. If you like water and don’t fear its murky depths you have plenty to do. You can go kayaking, water-trampolining or simply swimming around. It’s a different issue that my son’s initial enthusiasm got dampened after a soak in the cold water! Then there was Gangaswamy. You don’t need TV or music. If he likes you he can overwhelm you with his non-stop flow of words. Athirapally or Shivasamudram will be some minor cascades! He can keep you entertained all day. One unique characteristic is that he is very effusive in his ‘encouragement’ of his subordinates. He has them jumping. You can see the difference in BRT after his departure. He told me some forest land was being put on offer in Bhadra. Maybe I should consider it. 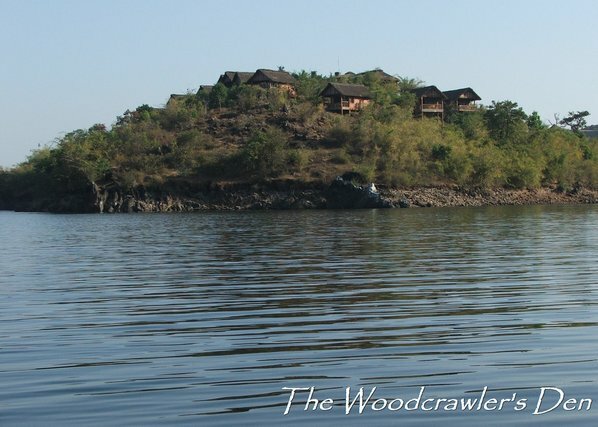 Bhadra seems to be a place where Woodcrawlers can retire to! Seriously, are you buying it? Sometimes we thought of buying a little land in the periferry of a WLS and simply fence it (on the outside). To provide some protection to the WLS. People are doing it around Bannerghatta NP. They bought a few stone quarries, stopped the activities and fenced it. I should think I'm serious. It's just that I need to make up my mind about "where". Bandipur was my choice last year but Bhadra seems to be competing for the slot. Your idea of "pools" to save nature seems to be a brilliant concept. Have you got a proposal? I will be interested.